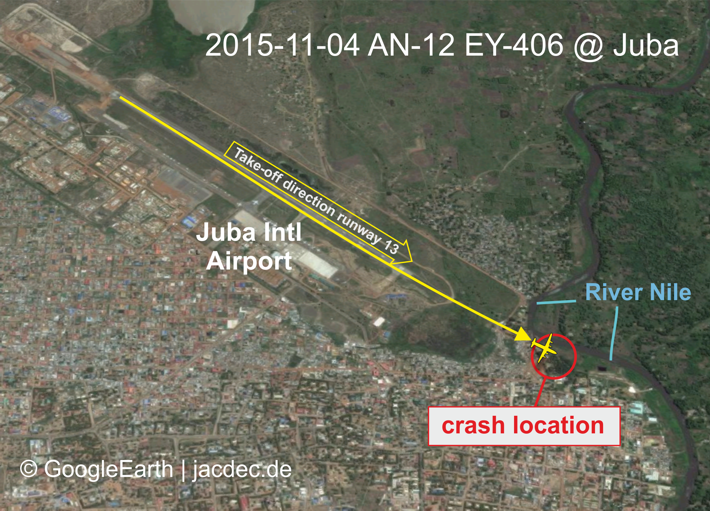 The cargo aircraft crashed about 1 Km from the end of the runway at Juba, Sudan after take-off killing 25 people. 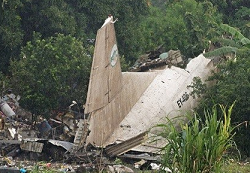 Very soon after take-off from runway 13, the pilots failed to gain sufficient height and impacted wooded hillside some 1000 meters after getting airborne. 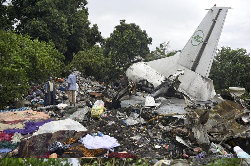 On impact the 4-engined cargo aircraft disintegrated. The main wreckage came to rest beneath the banks of the White Nile River. At present there are no robust casualty numbers but local police reported that 25 people are known to have been killed in the crash. Only one crewmember and one child are known to have survived. 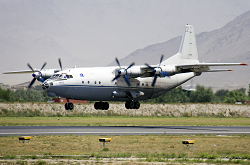 The Antonov AN-12 was on a cargo flight to the Paloich oil fields but rumoured to have a unknown number of unregistered passengers on board. There is speculation the aircraft have have been loaded beyond its limits.